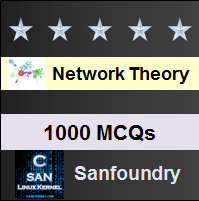 This set of Network Theory Multiple Choice Questions & Answers (MCQs) focuses on “Mesh Analysis”. 1. If there are M branch currents, then we can write ___________ number of independent equations. Explanation: If there are M branch currents, then we can write M number of independent equations. Number of independent equations = M.
2. If there are M meshes, B branches and N nodes including reference node, the number of mesh currents is given as M=? Explanation: If there are M meshes, B branches and N nodes including reference node, the number of mesh currents is given as M= B-(N-1). 3. 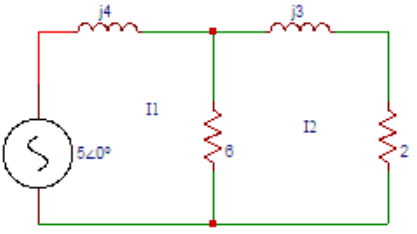 Determine the current I1 in the circuit shown below using mesh analysis. Explanation: The equation for loop 1 is I1(j4) + 6(I1-I2) = 5∠0⁰. The equation for loop 2 is 6(I1-I2) + (j3) I2 + (2) I2 = 0. Solving the above equations, I1 = 0.855∠-69.5⁰. 4. In the circuit shown in question 3 find the current I2. Explanation: The equation for loop 1 is I1(j4) + 6(I1-I2) = 5∠0⁰. The equation for loop 2 is 6(I1-I2) + (j3) I2 + (2) I2 = 0. Solving the above equations, I2 = 0.6∠-90⁰. 5. Find Z11, Z12, Z13 obtained from the mesh equations in the circuit shown below. Explanation: Z11= self impedance of loop 1 = (5 + 3 – j4) Ω. Z12 = Impedance common to both loop 1 and loop2 = -5Ω. Z13 = No common impedance between loop1 and loop 3 = 0Ω. 6. Determine Z21, Z22, Z23 in the circuit shown in question 5. Explanation: Z21 = common impedance to loop 1 and loop 2 = -5 Ω. Z22 = self impedance of loop2 = (5+j5-j6) Ω. Z23 = common impedance between loop2 and loop 3 = – (-j6) Ω. 7. Find Z31, Z32, Z33 in the circuit shown in question 5. Explanation: Z31 = common impedance to loop 3 and loop 1 = 0 Ω. Z32 = common impedance between loop3 and loop 2 = – (-j6) Ω. Z33 = self impedance of loop 3 = (4-j6) Ω. 8. Find the values of Z11, Z22, Z33 in the circuit shown below. Explanation: Z11= self impedance of loop 1 = (4 + j3) Ω. Z22 = self impedance of loop2 = (j3+3+j4-j5) Ω. Z33 = self impedance of loop 3 = (-j5+5) Ω. 9. Find the common impedances Z12, Z13, Z21, Z23, Z31, Z32 respectively in the circuit shown in question 8. Explanation: The common impedances Z12 and Z21 are Z12= Z21 = -j3Ω. The common impedances Z13 and Z31 are Z13 = Z31 =0Ω. The common impedances Z23 and Z32 are Z23 = Z32 = j5Ω. 10. 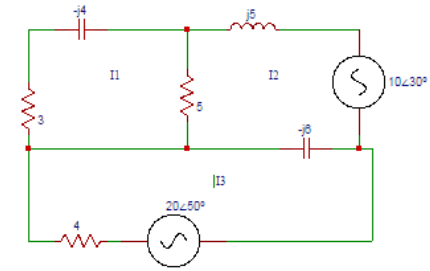 Find the value V2 in the circuit shown in question 9 if the current through (3+j4) Ω is zero. On solving, V2 = 17∠-262⁰.